Sometimes a single molten chocolate cake isn't enough. Sometimes a girl just needs a Giant Molten Chocolate Brownie Cake. 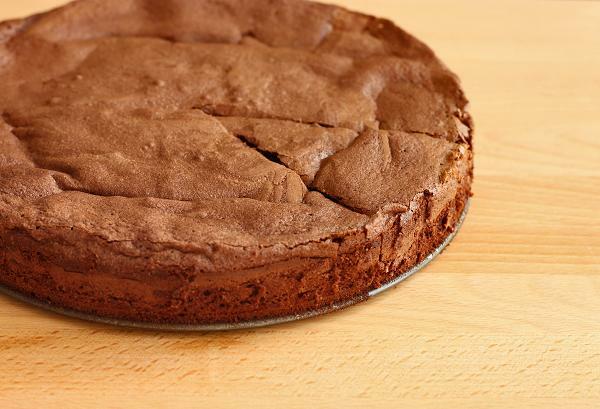 This dessert has the texture of a brownie, but uses the technique of a cake.....it kind of has two personalities. It starts with creaming butter and sugar. You've done that before right? The sugar crystals pierce through the fat and introduce air, creating little tiny air pockets that will stabilize the cake....or brownie. Eggs and vanilla are then beaten in until smooth, followed by melted bittersweet chocolate. Remember, bittersweet chocolate must contain a minimum of 70% cocoa solids. That's the good stuff. Did I mention there's also a bit of sour cream that goes in here? Ya. It's delicious. Then comes flour and cocoa powder, because adding more chocolateyness is always encouraged. Notice that there's a high ratio of eggs and sugar to flour in this cake....or brownie. That will keep it dense, moist and gooey in the middle. This way, even if this recipe is having an identity crisis, it will definitely know that it is indeed molten. I present this to you now because it is Friday. And I know that you, yes you, need this today. You need something that will kick-start your weekend and send it into high gear. Well this is just what the doctor ordered. 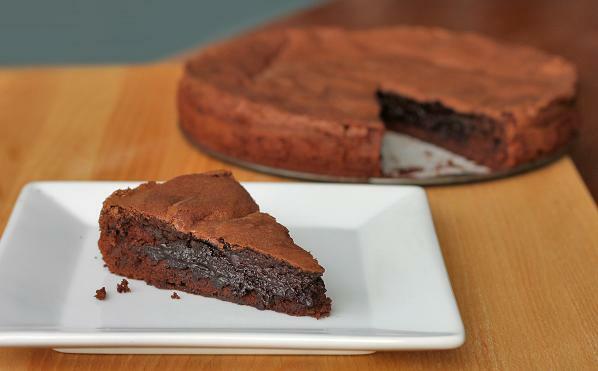 Fudgey, moist and gooey chocolate things are meant for Fridays (or everyday...whatever). This recipe is also easy and you probably already have all of the ingredients. It doesn't even need icing sugar, berries or anything fancy. The chocolate is enough....but perhaps a scoop of vanilla ice cream.... That couldn't hurt. So really, you have to make it. It's written somewhere in stone. I'll find that stone and FedEx it to you one day. Oh, and once you make it.....you'll understand the identity crisis thing. Brownie? Cake? No...wait. Brownie. No....cake. Preheat oven to 350 degrees F. Line the bottom of an 8-inch round springform pan with parchment paper and butter the sides. In a medium heatproof bowl set over a pot with ½-inch of barely simmering water, melt chocolate while stirring constantly; set aside and let cool slightly. In a small bowl, add flour and sift in cocoa powder. Stir to blend ingredients evenly. In a large bowl, beat butter until creamy using an electric mixer on medium speed. Add sugars and salt and cream together with butter on medium-high speed until crumbly and fluffy, about 1 minute. Beat in eggs, one at a time, beating until just blended after each addition. Beat in vanilla and sour cream until smooth. Add slightly cooled melted chocolate and beat on medium-low speed until well combined, scraping down sides of bowl as necessary. Add dry ingredients to chocolate mixture and beat on low speed until just incorporated and smooth, no more than 30 seconds. Pour batter into prepared pan and spread it out evenly. Bake 20 minutes. The surface will puff up and the center will be gooey. Transfer cake to wire rack and let cool in pan 10-15 minutes. 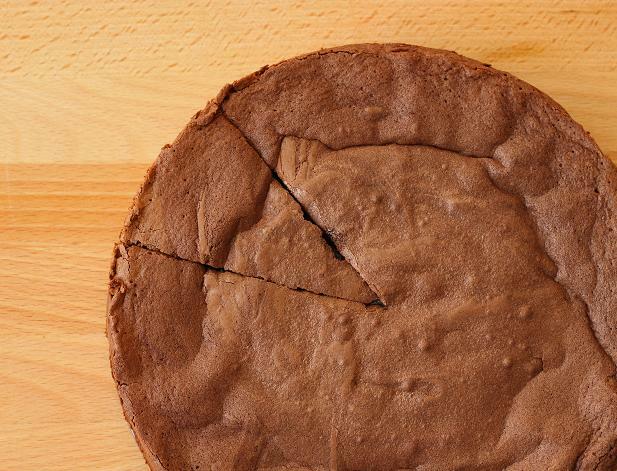 Run a knife around the edges of cake and remove sides of pan and serve warm. This looks divine. Simply want to grab a bite!! Bookmarking. This looks so perfect. I'm definitely going to have to try it sometime! Yum! This looks incredibly rich, just how I like my chocolate cake to be. WOW, looks so delish! I've tried a bit similar of this recipe, the difference is that this has a molted dark chocolate which is I'm excited about. I'll be doing this for the weekend! Deep, dark, dense dark chocolate brownie,very moist. 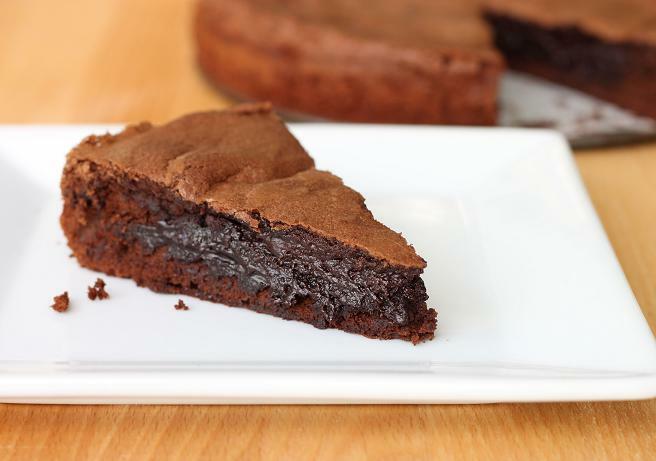 It is also one of my favorite brownie recipes. This goes way above and beyond 5 stars! This looks absolutely amazing. I cannot wait to try this recipe! I contemplated licking the computer screen, but realized that would get me no closer to this delicious looking cake...YUM!!!! Bookmarking this , yum! Great Job. Amazing thing! So sweet! So chocolaty! Yum! That looks like perfection to me. Girl I am seriously drooling all over this keyboard... I think I just fell in love with this recipe... Must. Make. NOW! Looks very dark and delicious. Thank you for sharing. This cake looks absolutely wonderful. I'd like to cook it for my birthday, coming up this Sunday, but I don't want to buy an 8" springform pan. Can I bake it in an 8" square pyrex dish or would that just ruin it? Thanks!!! @Anonymous Yes you can use an 8-inch pyrex dish but you may need to increase the cooking time by a few minutes. Just keep an eye on it! This looks amazing! It looks a little sinful for a chocolate lover like myself. My kids I know will love this as they love chocolate just as much as their mama! we were just a bit confused by the first sentence saying add sugars and cream together because it was too much information in one sentence. other than that...it's a dream. there are not words. because everyone took them all. Could this recipe be successfully multiplied to feed a crowd? Say, in 9x13 pans? I wouldn't bake it in a 9x13" pan because the surface area is so big that the portions in the center will just be raw unless you intend to over-bake it (but then it wouldn't be molten, right?). So, to feed a crowd I would just bake two. Have fun! This is the best recipe ever thankyou. Tastes even better with walnuts and cannabutter and golden syrup!!! hi, if i'm doubling the recipe, can i just double the ingredients while mixing the batter and then bake in two 8 inch pans? Yes you can try that but just make sure you measure very accurately, because things start to go wonky when you double, triple, (etc.) recipes. Best of luck! Looks delicious! I only have a 9" springform pan though, would that work alright? You can try that, but you will really have to watch the baking time so that you don't lose the molten center. Maybe cut back 3-5 minutes. Have fun! Can I make the batter ahead of time and bake later?